I don't know about you, but I'm liking the new trend towards mini desserts. It's not that I'm in to small portions, but I like a mini desserts because they allow me to try a variety of desserts. Yes, I'll sample the whoopie pie and ﻿the hand-held pie. 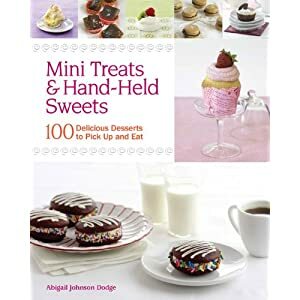 One of the newest cookbooks on the market that celebrates the mini dessert craze is Mini Treats and Hand-Held Sweets: 100 Delicious Desserts to Pick Up and Eat by Abigail Johnson Dodge. Each chapter has quite a selection of recipes that will appeal to bakers of all levels from simple shaped and bar cookies to biscotti and macarons. The chapter on mini cakes features several cupcake recipes that sound absolutely delicious such as Cinnamon Cupcakes with Toasted Walnut Buttercream and Carrot Cake Cone Cakes with Brown Sugar Cream Cheese Frosting. The Bite-Sized Treats chapters features desserts such as mini cheesecakes, tarts, and scones. The candies chapter is filled with ideas that will be perfect for holiday gift-giving such as White Chocolate Peppermint Bark and Spicy Buttery Caramel Popcorn. There's even a recipe for Homemade Marshmallow Chicks. Each recipe features advice from the author in the form of finishing touches, twists to change up the flavor combinations, and also time-saving do head instructions. In addition to some photos of the finished products, there are also helpful photos that clarify the methods used to create the desserts. You'll feel the author is beside you every step of the way. If you're a fan of dessert cookbooks and are looking for some unique sweets to serve at your next gathering, then this is the cookbook for you. Lightly grease the bottom of a 9x13-inch baking pan (the straight-sided type makes for a cleaner-looking cookie). Put the flour, cornstarch, and salt in a medium bowl and whisk until well blended. Put the butter and sugar into a large bowl and beat with an electric mixer fitted with the paddle attachment until smooth and creamy, about 3 minutes. Add the lemon zest, lavender, and vanilla and beat on medium until blended and fragrant, about 1 minute. Add the flour mixture and beat on low speed until the dough forms moist clumps. Dump the dough into the prepared pan. Using lightly floured fingertips, press the dough into the pan to form an even layer. Using the tip of a knife or a bench scraper, score the dough all the way through, forming 1x2-1/2-inch bars (1 inch across the short side and just a smidgen over 2-1/2 inches on the long one.). With the tines of a fork, prick each bar twice all the way through, spacing them evenly on the diagonal. Lightly flour the tines of the fork as necessary to prevent sticking. Slide the pan into the freezer or fridge for about 10 minutes while the oven heats. Position an oven rack in the center of the oven and heat the oven to 325 degrees. 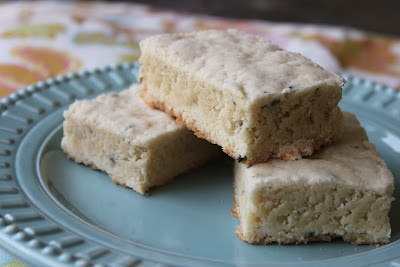 Bake the shortbread until the top looks dry and very pale brown, 30 to 34 minutes. Transfer the pan to a rack. Using a small paring knife of a bench scraper, immediately recut the bars using the scored lines as a guide. Let the shortbread cook completely before removing them from the pan. Disclaimer: The publisher provided me with a copy of the cookbook, but the opinion expressed here is my own. If there's one catch with these tidbits, it's that their size can lead people to over indulge. I actually know someone who had to have a root canal because of one too many brownies.